Located on one of the most majestic peninsulas in the world and offering spectacular views of the Sea of Cortes, Hyatt Ziva Los Cabos is a luxurious-all-inclusive oasis of sophistication and comfort. This magnificent beachfront resort is minutes from beautiful downtown San José del Cabo and features plush accommodations, impressive amenities, impeccable service and a myriad of activities. 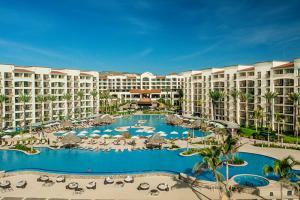 Located just 20 minutes driving from Los Cabos International Airport, 25 minutes from Cabo San Lucas.